2)There are many standard-sized skeins of DMC embroidery floss. For those who know what these are like, you can use these as scale for the rest of the items. 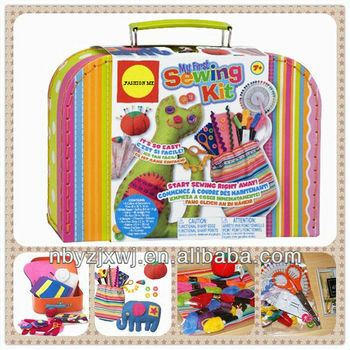 Lots of bright colors are included, and there is more than enough for sewing AND doing some decorative embroidery. It's a cardboard "suitcase", very well made, with nice bright stitching holding it together. The handle is plastic & metal, and the clasp is a standard type sewing box clasp. When you open the box, it looks chock full of stuff, unlike some kits which seem to be all packaging and then you open it and there is hardly anything in there. Ningbo F.T.Z Enjoy Stationery Co., Ltd.